In honor of birth mother’s day on 5/9 and Mother’s Day on 5/10, I wrote a guest post for the Portland Moms Blog, for whom I hope to be regularly contributing in the future. I am a wife of ten years, and stay-at-home mother to three little ones under eight. From an outsider’s perspective, I appear to be just an average Christian church-going, minivan-driving, play date-attending mom. But on the inside I have a secret. It’s not the kind of thing I can share at mom’s group or in PTA meetings. People at church and in prayer circles don’t really want to hear about it. Even most of my family either doesn’t know about it or tries to pretend it never happened. I am a birth mother. I stand by the choice I made as a scared, unmarried college student long ago. I believe that the life of that baby boy and my own are better than what they would have been if I hadn’t placed him for adoption. Because of that choice, I got to hand-pick his family, sign the papers, go back to my babyless life, finish college and grow up. And he got a loving, married mom and dad and a big sister that wanted him and had the means to take care of him. But years later, when life has moved on, I am married and have my “real” children; it has become almost socially unacceptable to talk about him. After all, he’s not my child. He is just some ghostly shadow that lurks in my past. Always there, but not really there. I remember as he grew inside me, but I don’t get to raise him. His birth is in my medical record, but his laughter is not in my home. He has my eyes, my face, my hair, but I don’t get to look at them each day. 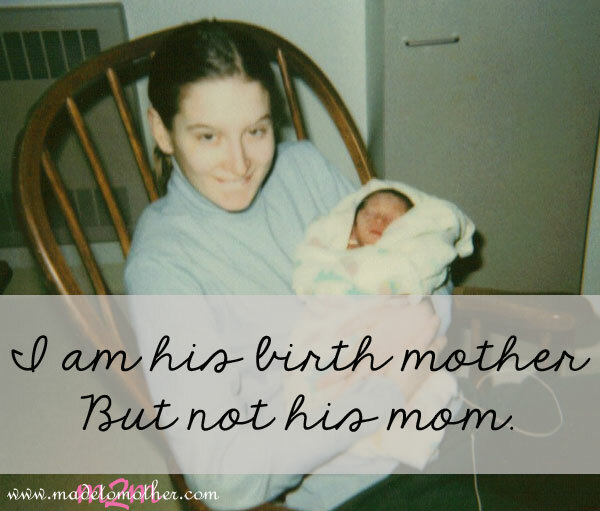 I am his birth mother, but not his mom….Finish reading over at the Portland Moms Blog! This is truly touching. SO powerful. Thank you for sharing your story. This is so beautiful! I’m sorry that so many people can’t understand how selfless this decision was, and yet how painful as well. Thanks, Stacey. To God be all the glory! I know how painful that must have been to share and I applaud your courage. I think that, through your actions, you gave that family (and the world) quite a gift… I understand it must hurt so much, and with the stigma in your family… Whew. I can only imagine. If it helps… I struggled with infertility for years, and it actually lead to the end of my first marriage. We had considered adoption and took all the initial steps, even met with a potential birth mother before finances forced us to pull out. Through the process, we agreed there was nobody in the whole world more important to us than the birth mother. She was who was making the big sacrifice in order to give us what we had been dreaming of. We thought then she was akin to royalty. Frankly, when I hear that’s what you did for somebody else, that’s what I feel about you too. She may be the day-to-day mother, but you’re the birth mother, as you said. There’s no taking that away from you. I hope one day you can celebrate it, as I’m sure that family does. Thanks, Jerusha, for the kind words and for reading today. Fascinating. Thank you for being brave enough to share your story. Thank you for sharing your journey with us. I am sure you are helping others out there who continue to struggle silently. You made a brave decision both in giving birth to and giving up your baby and then by sharing the story with others. Beautifully written. I cannot imagine the emotions behind this. You gave your son the greatest gift, by giving him life! !